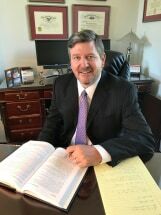 At the Scott C. Brown Law Office in Wheeling, West Virginia, my passion is helping people, my focus is criminal law, and my mission is providing my clients with the experienced, compassionate and skilled legal services they need and to which they are entitled. Whether residing in West Virginia or Ohio, my clients know they can count on me to give them personalized attention every step of the way through the resolution of their legal issues. I also am in federal court frequently representing those persons who have been charged with federal crimes or have received a "Target Letter" from the federal government. I also realize, however, that while facing criminal charges puts a client's freedom at stake, other clients face equally life-changing challenges when they are injured in a motor vehicle accident or when their marriage breaks up. Consequently, the Scott C. Brown Law Office is likewise proud to provide quality, cost-effective personal injury and family law services, with a reputation for getting results for clients and treating them with respect. At my law office, each client receives a free initial consultation, and I accept all major credit cards. In addition, no client ever receives a recorded message when they call me. A real person answers my phone 24 hours a day, seven days a week.